Impingement is a way of describing the catching or rubbing of the rotator cuff tendons and the fluid filled sac (bursa) on the bones and ligaments in the top of the shoulder. This can lead to inflammation and pain in the top part of the shoulder (bursitis). Intrinsic - this is due to a muscle imbalance, fatigue or wear and tear of the tendons. In these situations, the muscles are not working as well to hold the humeral head (ball) in the centre of the glenoid (socket). This can be a result of overuse from heavy work or due to poor posture in a more desk/driving based job. Muscle imbalances can occur even in sporting individuals despite taking part in regular exercise. This is usually caused by the stronger more well developed muscles at the front of the shoulder overpowering the weaker less well used muscles at the back. Finally, age related wear and tear of the muscles from years of use can lead to impingement syndrome. Extrinsic - this is where bony spurs and thickened ligaments in the top of the shoulder rub and wear the tendons of the rotator cuff and the bursa. These bony overgrowths tend to develop with age and are more likely to cause pain when the arm is in certain positions such as reaching forwards, twisting the arm and performing overhead tasks and sports. It is not clear why these spurs and thickened ligaments develop but it is likely that they are related to wear and tear and prolonged use of the shoulder. Most people experience pain at the side of the shoulder and upper arm. It is usually worse with movements such as reaching out to the side, reaching around your back or performing overhead tasks. Sleep is often affected by the discomfort. Some people also describe weakness in the shoulder. This is commonly due to pain and as such it is common to avoid certain activities. Painful clicking and catching is also a common complaint. Painless clicking however also occurs in many normal shoulders and is not always a sign of a shoulder problem. In mild cases, no further tests are needed. If your symptoms fail to settle then an x-ray may be requested. This is performed to look for bony spurs or other possible causes for your pain. In some situations it is difficult to determine if there is any underlying damage to the rotator cuff and as such an Ultrasound scan or MRI scan can provide further information. Pain control - initially treatment is centred around improving the painful symptoms. This involves the rest, avoiding painful activities and the use of pain killers such as paracetamol and anti-inflammatory medications. Your doctor or pharmacist should be able to advise which ones are safe for you to take. Sometimes stronger pain killers are necessary but these require a doctors prescription. Physiotherapy - this is absolutely essential in the successful management of impingement syndrome. Many people can be cured with a structured program of stretches and exercises to improve posture, build up core strength and help position the shoulder blade better. Resistance exercises are used to build up the strength in the rotator cuff muscles, particularly the ones at the back of the shoulder. Injections - these can provide excellent pain improvement by reducing inflammation and swelling in the bursa (fluid sac above the rotator cuff tendons). Reducing the swelling can also provide more room for the tendons to move. The local anaesthetic effects are fairly short lived and steroids can take anything from a few minutes to a couple of weeks to take effect. Usually the pain relieving effects of the steroids can persist many months. Side effects of steroids are uncommon but can included the injection not having any pain relieving benefit, damage to the rotator cuff tendons (especially if too many are administered), infection and post injection flare of symptoms (lasting 2-3 days - 5%). What happens if these treatments don't work? Where the previous treatments have failed to improve your symptoms sufficiently, then keyhole surgery is considered. It is important to have tried at least 6 months of good structured physiotherapy and to consider injections prior embarking on this stage of treatment. The surgery is known as a Subacromial decompression. It can be performed under general anaesthesia (asleep) or with you awake after having an injection to make the arm and shoulder go numb (brachial plexus block). The surgery requires two small incisions, both around 8mm in size which are placed at the back and the side of the shoulder. 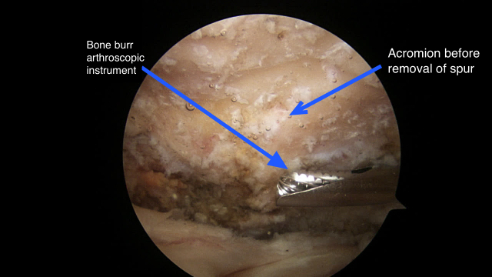 A small camera (arthroscope) is inserted into the joint and a full inspection of all structures is carried out. The camera is then placed into the top part of the shoulder (subacromial space) and any inflammation, bone spurs and thickened ligaments can be shaved away and removed. This allows the tendons to glide more freely. The procedure takes approximately 30 mins. The success rates for the surgery are approximately 80-85% over the course of 3 to 12 months. Some patients feel a great benefit from the operation in the first few weeks however it is also normal to feel quite sore in this period. We would expect you to be noticing some improvement by 3 months post surgery and continue to improve in the subsequent 9 months. Complications are uncommon but persistent pain or stiffness (frozen shoulder) are occasionally seen. Rare complications include infection, nerve injuries, blood clots in the legs or lungs, nerve injuries, and strokes. The surgery is surgery performed as a day case, meaning that you usually leave hospital the same day. A sling is provided however we encourage you to get the arm and shoulder moving as quickly as pain allows (after the nerve block has worn off). It is normal to be sore in the first couple of weeks after the procedure and your normal painkillers can be taken. The stitches require removal after 10 days and we will give you a letter so this can be performed by your local practice nurse. Physiotherapy will be organised after the surgery and this forms an essential component of your recovery and outcome.